President Donald Trump waves on the West Front of the U.S. Capitol on Jan. 20, 2017 in Washington, D.C. 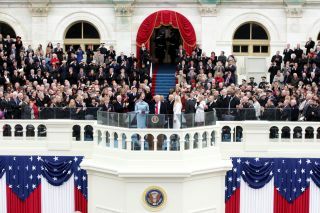 He became the 45th president of the United States during the inauguration ceremony. President Donald Trump took the oath of office in Washington, D.C., today (Jan. 20) and mentioned space exploration — if for one fleeting moment — as one of the paths forward to make America great again. President Lyndon Johnson mentioned space exploration during his inaugural speech on Jan. 20, 1965. Johnson had become president on Nov. 22, 1963, after the assassination of President John F. Kennedy. At the time, the United States and Soviet Union were locked in a space race to the moon and Kennedy had challenged NASA to achieve a crewed lunar landing by the end of the decade. It was a challenge that NASA, and the country, would ultimately meet. "Even now, a rocket moves toward Mars," Johnson said (it's at the 1:40-minute mark in the video). "It reminds us that the world will not be the same for our children, or even for ourselves, in a short span of years." According to a transcript of Johnson's speech, he wrote that seeing Earth from a Mars-bound rocket would inspire a sense of unity. "Think of our world as it looks from the rocket that is heading toward Mars. It is like a child's globe, hanging in space, the continents stuck to its side like colored maps. We are all fellow passengers on a dot of Earth. And each of us, in the span of time, has really only a moment among our companions. How incredible it is that in this fragile existence, we should hate and destroy one another. There are possibilities enough for all who will abandon mastery over others to pursue mastery over nature. There is world enough for all to seek their happiness in their own way." Mariner 4 successfully flew by Mars later that year, on July 15, 1965. It was NASA's first successful Mars flight and returned 21 pictures of the Red Planet. NASA's Johnson Space Center in Houston is named in honor of President Johnson, who hailed from Texas. On Jan. 20, 1969, President Richard Nixon cited space exploration and its promise for the future several times during his first inaugural speech. The speech occurred just weeks after NASA's Apollo 8 mission, which sent three astronauts around the moon and captured the iconic photo of Earth rising over the lunar surface. You can watch the full speech on C-SPAN. "In throwing wide the horizons of space, we have discovered new horizons on Earth," Nixon said in his speech. "Those who would be our adversaries, we invite to a peaceful competition — not in conquering territory or extending dominion, but in enriching the life of man," he said. "As we explore the reaches of space, let us go to the new worlds together, not as new worlds to be conquered, but as a new adventure to be shared." "Only a few short weeks ago, we shared the glory of man's first sight of the world as God sees it, as a single sphere reflecting light in the darkness. As the Apollo astronauts flew over the moon's gray surface on Christmas Eve, they spoke to us of the beauty of Earth, and in that voice so clear across the lunar distance, we heard them invoke God's blessing on its goodness. "In that moment of surpassing technological triumph, men turned their thoughts toward home and humanity, seeing in that far perspective that man's destiny on Earth is not divisible, telling us that however far we reach into the cosmos, our destiny lies not in the stars but on Earth itself, in our own hands, in our own hearts." Just seven months after Nixon's speech, on July 20, 1969, NASA's Apollo 11 mission landed on the moon, marking the first-ever crewed lunar landing. On Jan. 21, 1985, President Ronald Reagan referenced space in his second inaugural address. Early on, he mentioned NASA's Apollo moon landings. You can see the video here, courtesy of the Reagan Foundation. "We have lighted the world with our inventions, gone to the aid of mankind wherever in the world there was a cry for help, journeyed to the moon and safely returned. So much has changed. And yet we stand together as we did two centuries ago." "I have approved a research program to find, if we can, a security shield that would destroy nuclear missiles before they reach their target. It wouldn't kill people. It would destroy weapons. It wouldn't militarize space. It would help demilitarize the arsenals of Earth. It would render nuclear weapons obsolete. We will meet with the Soviets, hoping that we can agree on a way to rid the world of the threat of nuclear destruction." So that's a short look back on mentions of space exploration in the inaugural speeches of American presidents. A hat tip to collectSPACE.com Editor Robert Pearlman for his help in compiling this retrospective. With Trump's administration now in full swing, the next major milestone will be the naming of a new NASA administrator to lead the agency over the next four years. Charles Bolden, NASA's chief during the Obama administration, is stepping down, with the agency set to be led by Associate Administrator Robert Lightfoot until Trump selects a new agency head.